Glad we have no jobs. 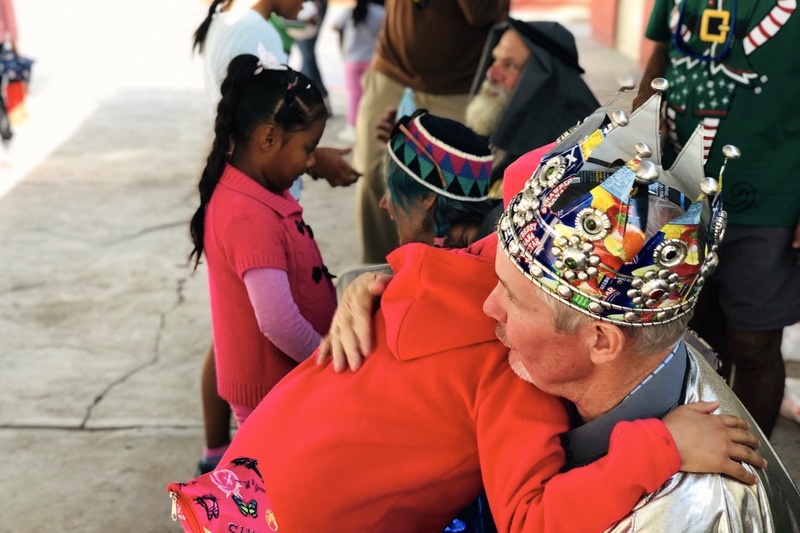 >Delivered 750 Three Kings’ Day gifts–including hundreds of soccer balls–to children in five villages outside San Miguel de Allende last week. That means hundreds of kids got a fist-bump-and-hand-slap from their new uncle, Tio Galleta (Uncle Cookie). That would be me. >Our casa welcomed thirty-five neighborhood niños for Three Kings’ Day. Our street should now be called Calle de Pelotas de Fútbol (Street of Soccer Balls). >Friend’s baby is almost six months old. Emilia has grown into her Seattle Seahawks clothes we brought her. And, after last week’s playoff game, she doesn’t like the Dallas Cowboys. >Gasoline thieves are called huachicoleros and they steal by tapping pipelines. The new Mexican president is trying to stop them by shipping gas via trucks instead. Which is slower than the pipelines. A. Lot. Slower. That’s the reason for long lineups at gas stations in many Mexican states, including ours. Our car’s tank is full, San Miguel is a ‘walking town’, and this is not a problem for us. Yet. >Designed and had a local luthier build a guitar about six months ago. It’s a beauty made of palo escrito which translates to ‘written stick’ but you probably know it as Mexican Rosewood. And, yes, my fingers hurt. >The daytime temps here were in the 80s last week. Only 75 most of this week. Met some folks from the Eastern USA who said something about “…lousy weather up there…” and are considering moving here. Sounds reasonable. >San Miguel has more than 300 restaurants including the delicious street stands. Noticed five new restaurants on a short walk the other day. Karin found two more. A few days later I spotted three. So, there’s a new total number of restaurants in town and nobody knows what it is. Does make me hungry thinking about it, though. >Finally, plans for the GNART (https://kwtour.wordpress.com/2018/12/11/kwt-12-11-18-g-n-a-r-t/) are wrapping up. Karin and I have mapped routes, located hotels/motels, and searched for sights to see. Should be on the GNART for at least one-hundred days…there are fifty-eight towns where we’ll stay at least one night…we’ll travel eleven-thousand miles…and, it thirty-nine days until we leave. It was my turn to be a King at a school in the hills around San Miguel. This girl was so happy to get gifts that she gave a great, big hug. The highlight of the week.